Brazil’s most important environmental legislation is on the chopping block again, with politicians in the country’s lower chamber proposing to alter it by claiming it impedes economic growth. Brazil’s Forest Law (also known as the Forest Code) was first enacted in 1934 and determines how much a landowner can deforest and how much must be kept as a "legal reserve". The percentage of a forested property that needs to be set aside as a legal reserve varies from region to region. Currently in the Amazon, the law states that 80% of a property has to remain forested. For the Cerrado, this figure is 20%. A proposed amendment to the law by the ‘ruralistas’, and put forward by Federal Representative Aldo Rebelo of the Brazilian Communist Party would make profound alterations to the law. Representative Rebelo has said the changes will address the outstanding needs of Brazilian agriculture, especially in the case of small-scale farmers and livestock producers. In June 2010, a proposed revision to the Forest Law was submitted to Brazil’s Congress that claimed that the current law is holding back Brazil’s economic development. This proposal is led by a disproportionately large delegation representing the agribusiness sector. In July, a congressional committee approved the proposal, moving it for consideration to the full Chamber of Representatives and then to the Senate. Voting on the alterations by the lower chamber has been delayed several times, as recently as late last week. The vote now is expected to come up again soon, possibly as early as next week. If it passes, it will then move onto senators, and then to the country’s president for consideration. This comes as Brazil prepares in 2016 to host the Olympic Games, and ahead of the United Nations’ Conference on Sustainable Development (Rio +20) in June 2012. Rio+20 is a major meeting attended by heads of state focused on securing renewed political commitment for sustainable development. If the amendment is approved, it will be done without heeding suggestions made by the federal government, the scientific community, the evaluations of environmental groups, or the opinions of the family-based agriculture sector who have all weighed in against the proposed changes. “If the amendment is voted as it stands now, it will be the first Forest Law elaborated in Brazil since 1934, without any scientific input whatever. If we had more time to debate the issue we would have an opportunity of constructing environmental legislation suitable for the 21st century, modern and scientifically illuminated,” stated Antônio Nobre, a researcher at the National Institute of Space Studies (Inpe). The proposed changes also would roll back one of the most effective pieces of legislation to protect forests and biodiversity in the country, while at the same time slowing Brazil’s reduction of greenhouse gas emissions. "Representative Aldo Rebelo is creating a series of snares and agendas hidden in the modifications he made to the text,” said Carlos Alberto de Mattos Scaramuzza, Conservation Director at WWF-Brazil. Among the tricky catches Aldo Rebelo has included in the text is empowering more than 5,500 municipal authorities to authorise forest clearing, even in areas currently under environmental protection. The legislation opens up the possibility of doing so for “any area that is to be dedicated to the production of foodstuffs”. It also transfers the onus for the demarcation and registration of the legal reserve areas – areas of natural vegetation that must remain undisturbed on every rural landholding – to municipal government bodies. This will effectively pass control of deforestation will pass from the federal government to a piecemeal state by state approach among local municipalities, in turn allowing for strong agribusiness interests being influential in the interpretation of the law. Under this scenario, a strong upsurge in deforestation is expected. The proposal now before the Chamber of Representatives additionally brings with it a series of other threats to Brazil’s great natural wealth, and not only to the Amazon region. It reduces the mandatory width of the protective strip of gallery forest vegetation that must be preserved along the courses of streams and rivers; liberates the tops of hills, mountains and plateaus for cattle raising activities; permits the felling of tree species under threat of extinction like the Brazilian Pine, and reduces the socio-environmental functions of rural landholdings by diminishing the percentages of natural vegetation that must be maintained on them. The debate about Brazil’s Forest Law comes as a new global analysis released last month showed that more than 230 million hectares of forest around the world will disappear by 2050 if no action to stop deforestation is taken. The first chapter of WWF’s Living Forests Report, released April 27, examines the drivers of deforestation and identifies the opportunities to shift from business as usual to a new model of sustainability, which can benefit government, business and communities. The report proposes that policymakers and businesses unite around a goal of zero net deforestation and forest degradation (ZNDD) by 2020 as a groundbreaking global benchmark to avoid dangerous climate change and curb biodiversity loss. NOTE: This story was updated May 12 and May 17. 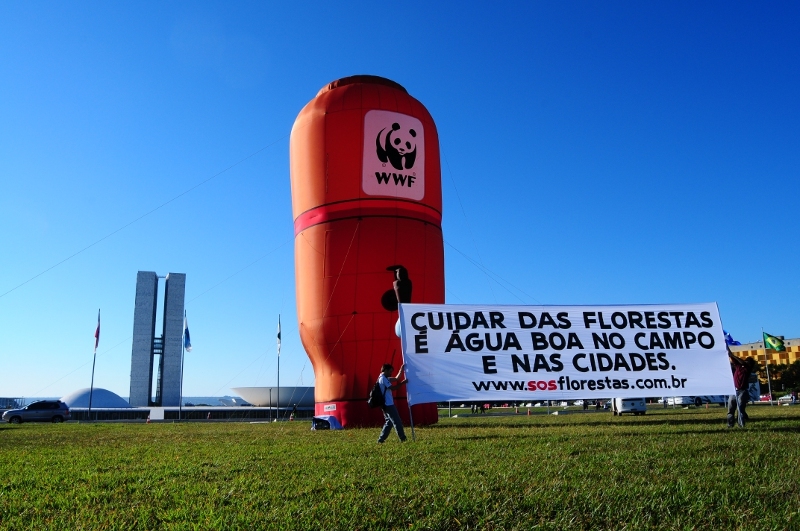 On Wednesday, WWF-Brazil set up a huge inflatable model of a domestic water filter surrounded by banners calling for changes in the proposed amendment to the Forest Law and bearing slogans like “Taking care of forests means good water for town and country alike”. 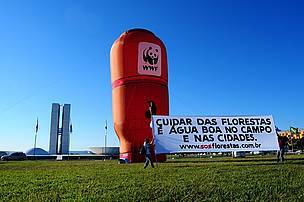 The action was designed to warn Brazilian society about the importance of the areas of permanent preservation and legal reserve for the conservation of biodiversity and water resources, both of which are of fundamental importance to agricultural activities.